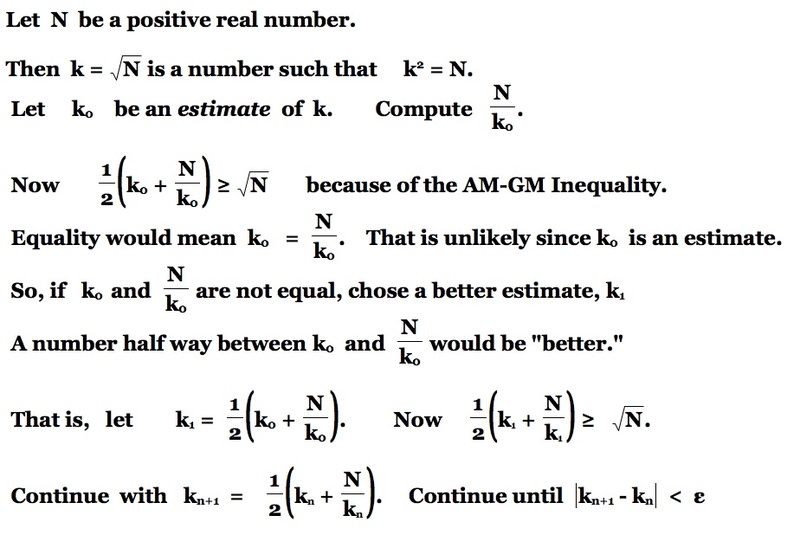 Using the Arithmetic Mean-Geometric Mean Inequality in Problem Solving. A Presentation to the Annual Meeting of School Mathematics and Science Association, Birmingham, November 8, 2012, was prepared using some parts of this paper. and the sub-directory for my mathematics problem solving course at the University of Georgia. 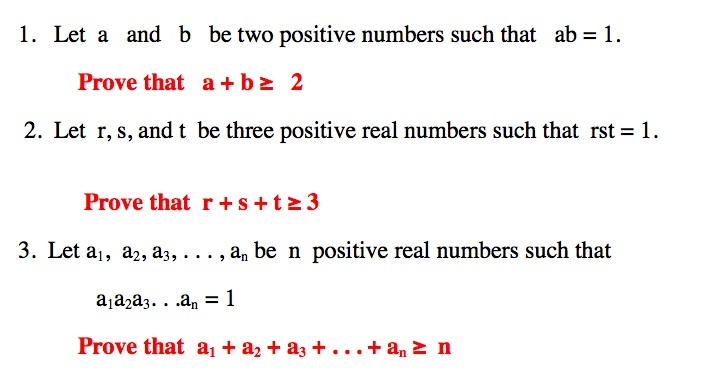 I will concentrate on the theorem for two positive numbers in my examples, but I mention the generalizations below and occasionally use the case for three positive numbers. At a more advanced level (perhaps more fundamental?) all of these means are instances of Power Means where the power parameter p takes on different values for the different means. These may also be called Generalized Means. What is the Value of this Theorem? An Example. 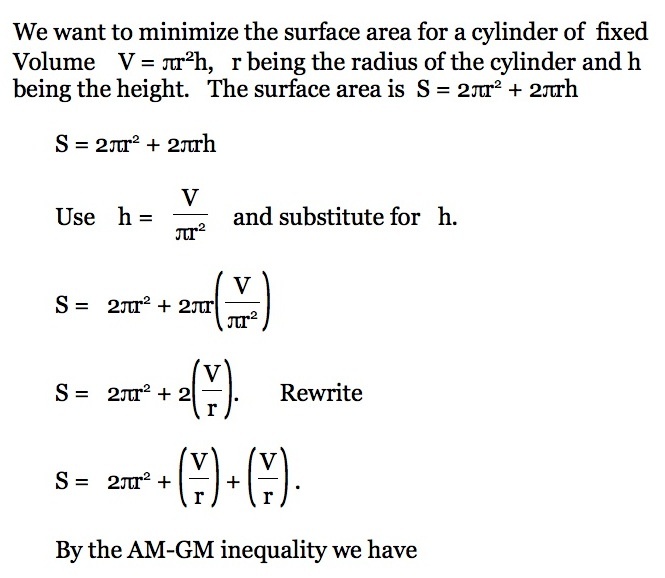 The AM-GM for two positive numbers can be a useful tool in examining some optimization problems. For example, it is well known that for rectangles with a fixed perimeter, the maximum area is given by a square having that perimeter. Ed. Comment: The word "minimum" in the second sentence below should be "maximum"
2a + 2b = 10. The red graph represents the area function of the graph as either of a or b varies from 0 to 5. Let b represent the length of one side and 5 - b the length of the other. Points on the blue curve, Area = 6.25 are always greater than points on the red curve (That is, the area of the rectangle is always less that 6.25) and the blue curve (a horizontal line representing a constant) is tangent to the red curve if and only if b = (5 - b), i.e., b =2.5. Setting this up with the usual function notation, let the Perimeter of the rectangle equal 10 and let one side be x. The the other side is 5 - x. 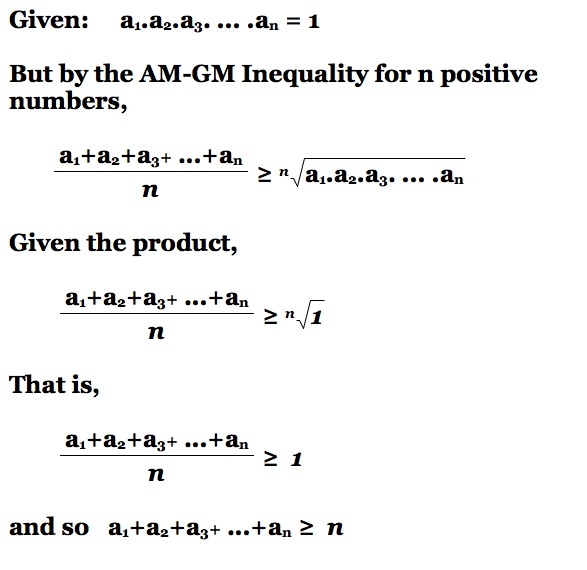 The utility of the AM-GM Inequality is that the replacement function after the application of the AM-GM inequality is a constant line tangent to the previous function. The area is always less than the constant AND it is equal to that constant when a = b. 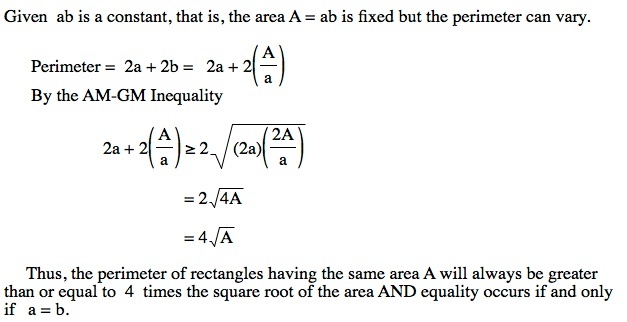 In our example for P = 10, a = b = 2.5 when the rectangle is a square. 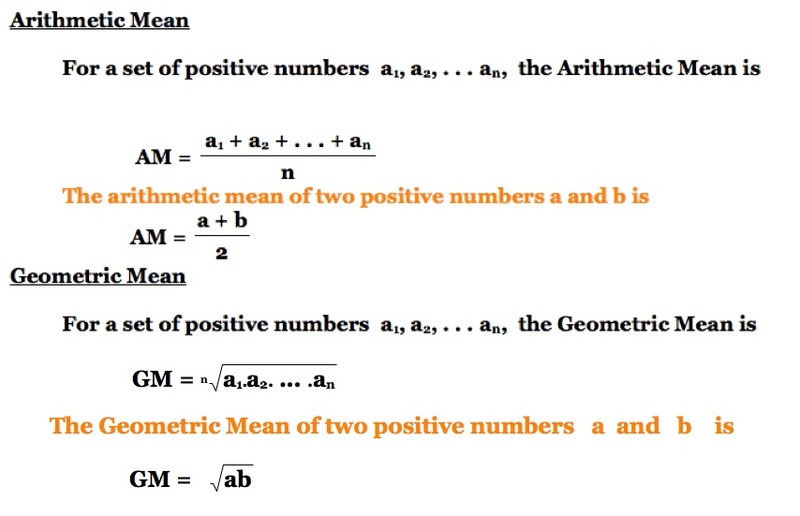 In this section, I will limit the exploration to the simplest case: The arithmetic mean and geometric mean of two positive numbers. 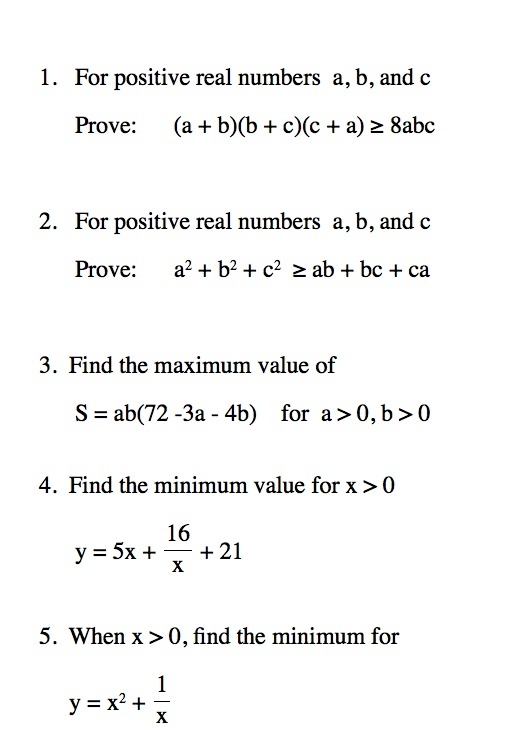 In my Problem Solving course I pose AS AN EXPLORATION that the student find a least 5 demonstrations or proofs. Seeing multiple approaches to this relation can help with understanding it, seeing its importance, and finding it useful as a problem solving tool. Construct a semicircle with a diameter a + b. The radius will be the Arithmetic Mean of a and b. Construct a perpendicular to the diameter from common endpoint of the segments of length a and b. 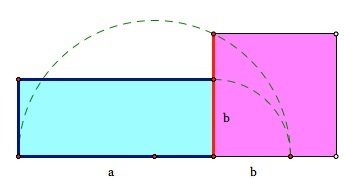 From the intersection of this perpendicular with the semicircle construct the red segment. 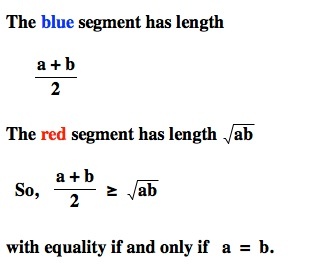 This segment will always have a length less than or equal to the radius of the circle and it will be equal only if a = b. 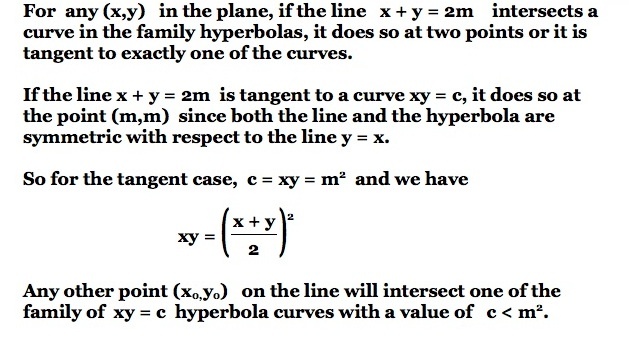 This example is closely related to the well known geometric theorem that the altitude of a right triangle from the 90 degree vertex to the hypothenuse will be the geometric mean of the two segments cut off on the hypotenuse. 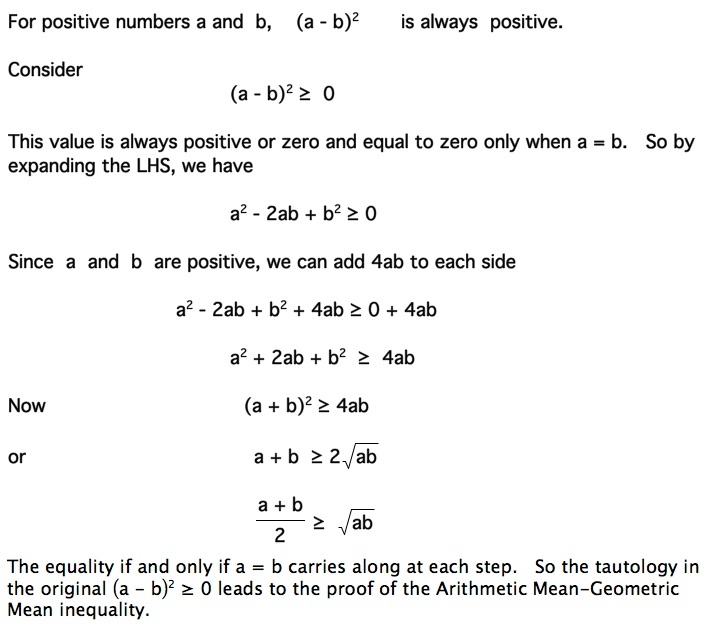 Since we have with equality if and only if a = b. Given two tangent circles of radii a and b. Construct a common external tangent to the two circl3s and draw radii of each circle to the common tangent. 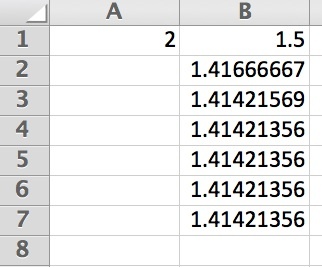 Find the length indicatec by ? along the common tanget in terms of a and b. Solution: by constructing a segment parallel to the one under study, a right triangle with legs of length ? and a-b, and hypotenuse of length a+b. the segment along the common tangent has length twice the geometric mean of a and b. 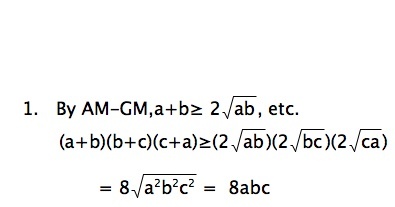 By an elementary theorem of geometry the products of the parts of the chords are equal. 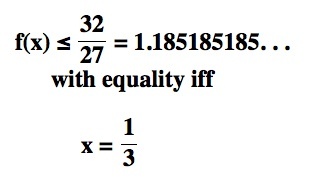 We know that x + y ≥ 2z with equality only if M is the midpoint of CD. 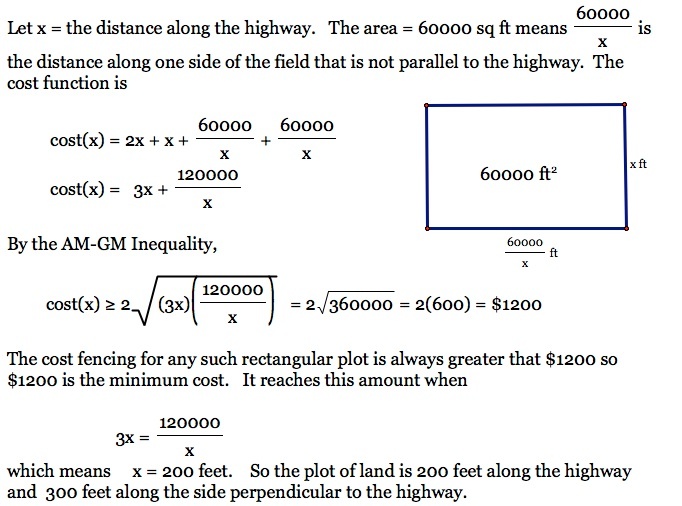 Problem: A farmer wants to fence in 60,000 square feet of land in a rectangular plot along a straight highway. The fence he plans to use along the highway costs $2 per foot, while the fence for the other three sides costs $1 per foot. How much of each type of fence will he have to buy in order to keep expenses to a minimum? What is the minimum expense? 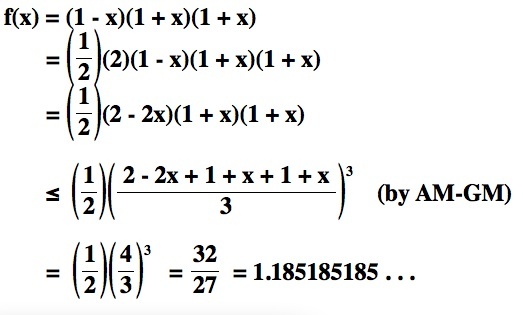 The problem is to find minimum values for this function in the range or 0 < x < π. 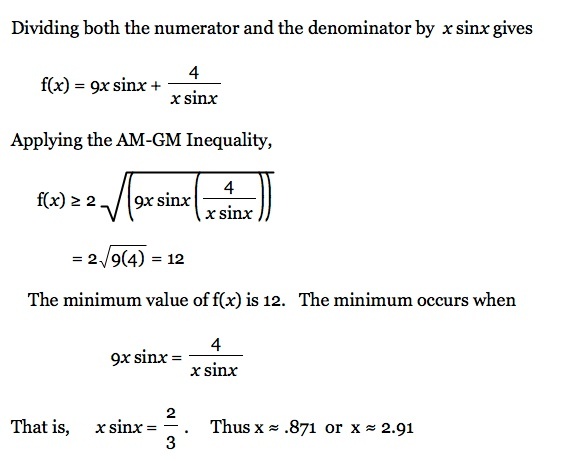 This one requires some change in the form of the equation in order to apply the AM-GM Inequality. First, however, it is helpful to see a graph and have some sense of the equation. 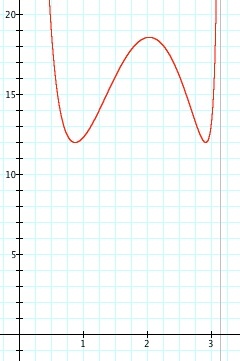 The graph at the right suggests that there may be two minimum values in the range 0 < x < π. The problem is to construct a square with straightedge and compass that is the same area as a given rectangle. The area will be ab and so the length of the side of the square is the geometric mean. 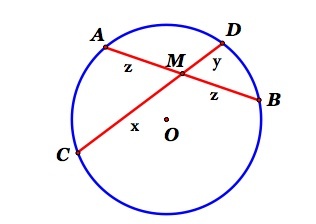 The red segment is the geometric mean of a and b.
Construct segments from the endpoints of the diameter to complete a right triangle. Therefore the value of the function is always less than or equal to .5 and it is equal to .5 only when x = 1.
and equality occurs when x = -1. Therefore the value of the function is always more than or equal to -0.5 and it is equal to -0.5 only when x = -1. 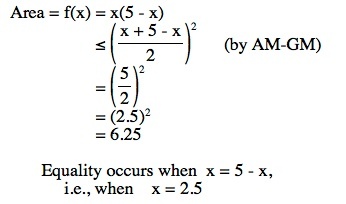 We have three factors in the function and we want to know when the function reaches a maximum in the interval [0,1]. In packaging a product in a can the shape of right circular cylinder, various factors such as tradition and supposed customer preferences may enter into decisions about what shape (e.g. short and fat vs. tall and skinny) can might be used for a fixed volume. Note, for example, all 12 oz. soda cans have the same shape -- a height of about 5 inches and a radius of about 1.25 inches. Why? What if the decison was based on minimizing the material used to make the can? This would mean that for a fixed volume V the shape of the can (e.g. 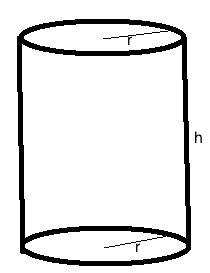 the radius and the height) would be determined by the minimum surface area for the can. What is the relationship between the radius and the height in order to minimize the surface area for a fixed volume? What would be the shape of a 12 ounce soda can that minimizes the amount of aluminum in the can? The Surface area is a function of r and h.
What is the minimum S? Suppose you have 100 feet of fencing. You want a rectangular pen with a partition parallel to a side. The 100 feet of fencing must enclose the four sides and the partition. 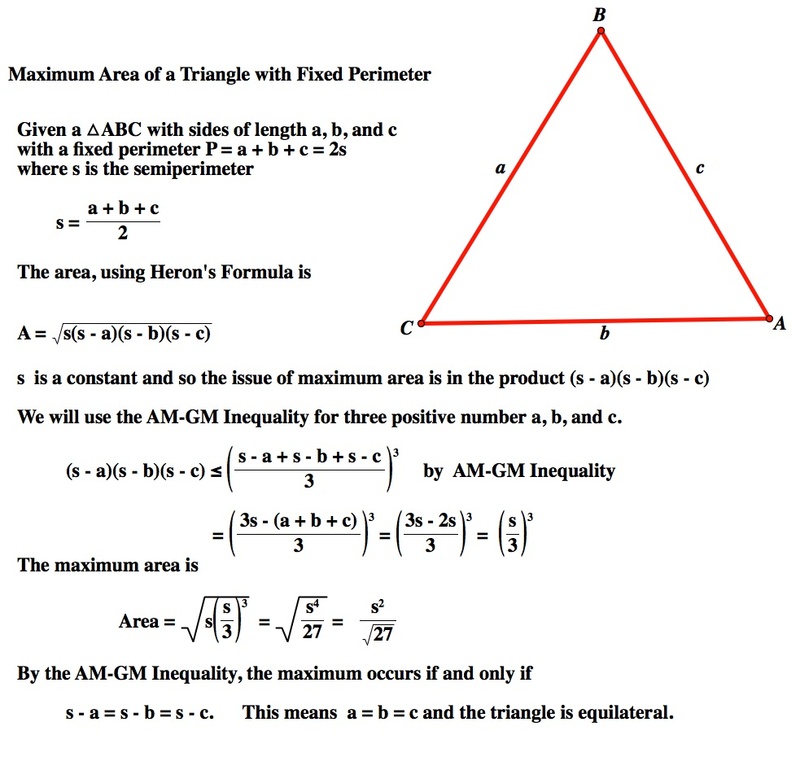 What is the shape of the pen and what is the maximum area? Show that the dimensions of the maximum area pen is 25 ft. by 16.67 ft. with maxim area of approximately 417.7 sq. ft.
Find a point on the graph of that is closest to the origin. Given a triangle with one side of length 9 units and the ratio of the other two sides is 40/41. Use the Arithmetic Mean-Geometric Mean Inequality to find the maximum volume of a box made from a 25 by 25 square sheet of cardboard by removing a small square from each corner and folding up the sides to form a lidless box. Theorem: In the Product of n positive numbers is equal to 1 then the sum if the numbers is greater than or equal to n.
This sets up an efficient process for obtaining successive estimates with a hand calculator, a spreadsheet, or by paper and pencil. On the right is a part of a sqreadsheet showing calculation for . The process quickly converges to a good estimate. Click HERE for the Excel file. Enter in cell A1 the value N for which the square root is wanted.